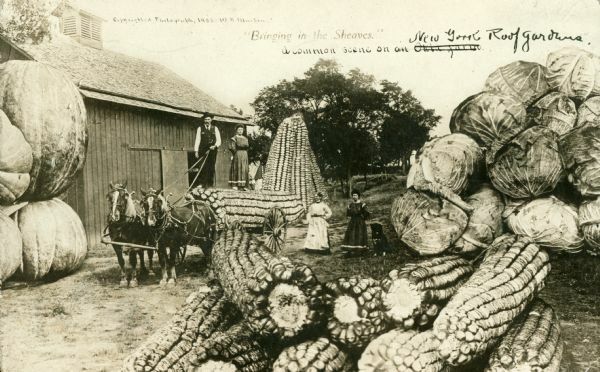 Photomontage of a farm scene with giant produce. A man and a woman stand on top of a giant ear of corn, resting on a horse-drawn cart. Around them are more giant corn cobs, cabbages, and pumpkins. Beside them stands a large wooden barn. In the upper center the words, "'Bringing in the Sheaves' a common scene on an Okla farm," are written. The original user of this postcard crossed out "Okla farm" on the post card and handwrote the words "New York Roofgardens" above it.